A weak week ends with a bang. Chevron buys Anadarko leading us to buy more Chesapeake. Reviewing our hedges with 2 ways to short the Futures on this rally. At 4 AM, the week turned positive in the Futures. A bit later, it was announced that Chevron (CVX) was buying Anadarko (APC) for $33Bn AND CVX will spend another $5Bn buying back 2% of their own stock. That's pumping up the energy sector into earnings season as APC is getting a 44% premium to yesterday's close, which is an indicator that the energy sector stocks may be underpriced by quite a bit or it's simply a play to capture Natural Gas assets (NG), which we are long on. CHK has 1.5Bn barrels of oil equivalent reserves, 80% of which is NG, which is the same as APC but you can buy CHK for $5Bn - as long as you are willing to assume their $9Bn in debt. But still, $14Bn is a lot less than $33Bn, so we are loving our CHK position! CHK is also a position in our Options Opportunity Portfolio - with positions we published over at Seeking Alpha. The OOP is a smaller portfolio than the LTP, having started with $100,000 on Jan. 2, 2018, so we took a more conservative position with a conservative target we've already hit. Still, the cash outlay here was only $2,500 and, at $3.50, it pays us back $6,250, and as you can see, we've already gained $3,980 though we do have 20 calls uncovered - so we could do better over $3.50. That nets you into the $7,500 spread for net $710, so $6,970 (956%) upside potential if CHK is over $4.50 in Jan. 2021, but if they get bought sooner, you can collect in full at the close. Because we sold some puts to offset the cost, we risk being assigned 2,000 shares of CHK at $4, which is more than it currently trades for, so this is an aggressive play and the ordinary margin requirement on the puts is about $4,000 - so it's still an efficient way to make $6,970 if all goes well. 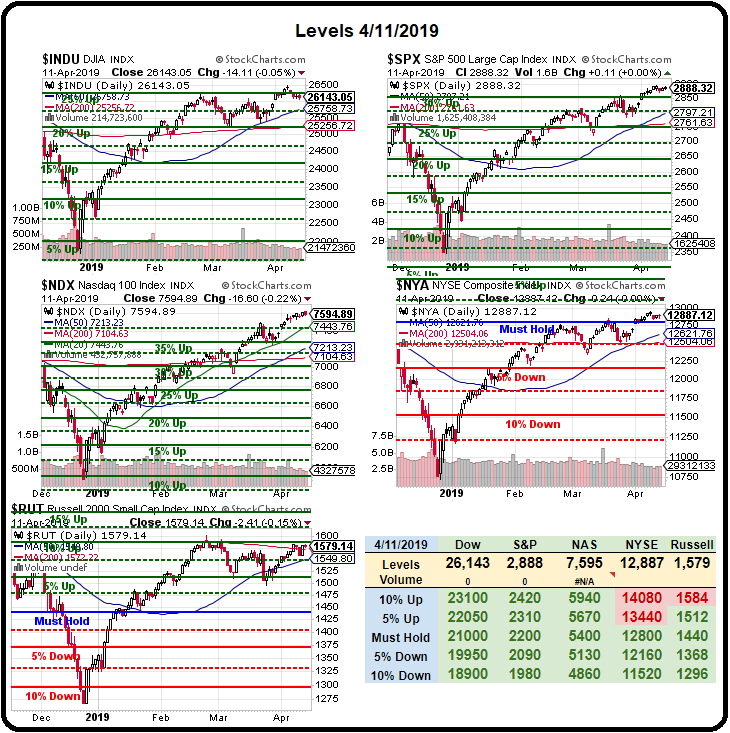 We survived this week's data and we have some bank earnings today and JPMorgan (JPM) already announced a beat and that Dow component is up 2.5%, so, now, Bank Stocks and Energy Stocks are heading higher. I don't think we're out of the woods yet and we'll once again be taking some of our ill-gotten gains and adding more hedges. 1,595 is a good spot to short the Russell (RTY) Futures but very, very tight stops above 1,600 - as that would be a clear break-out. Yesterday's Silver (SI) play hit our $14.90 target and popped back to $15, where we took our $500 per contract profit and ran into the weekend! 2,910 on the S&P (ES) is also a good shorting line. Our hedges from last Tuesday are cheaper now than they were then, but I couldn't sleep over the weekend without them protecting our portfolios. Disclosure: I am/we are long CHK. I wrote this article myself, and it expresses my own opinions. I am not receiving compensation for it. I have no business relationship with any company whose stock is mentioned in this article.